What a difference a fortnight can make. True to the Portuguese saying “Em Abril, águas mil” (lit. 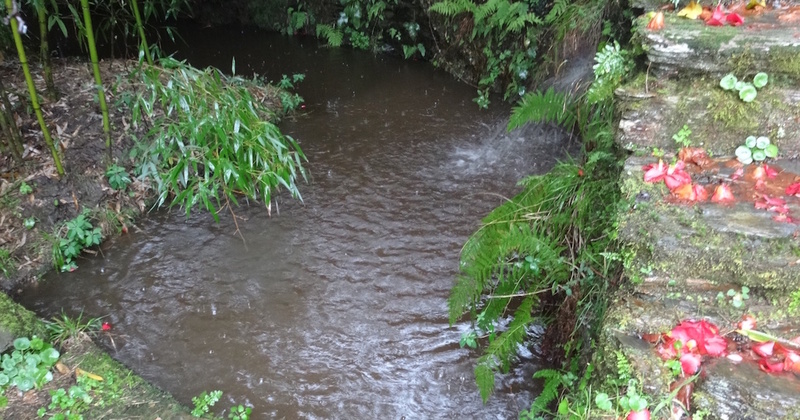 in April, a thousand waters), April showers began on April 1st, breaking the long spell of drought we’ve had since a few downpours in early November. Really though, it hasn’t rained ‘properly’ since last May. The amount that’s fallen so far is still small and only the top 8cm or so of the soil is damp, but the difference it’s made to the vegetation on the quinta is remarkable. 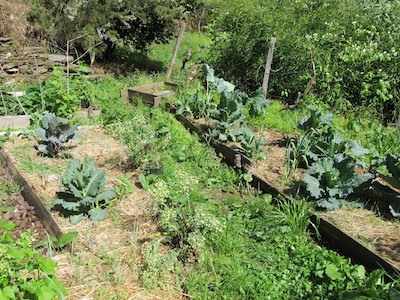 A month ago, the raised beds looked all but empty bar the few stunted cabbages and remaining mangelwurzels that had managed to hold on through the dry winter and its frosts. 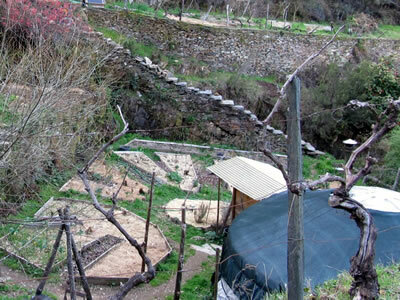 None of the usual early vegetables were showing any signs of breaking dormancy and only the fruit trees were blossoming. 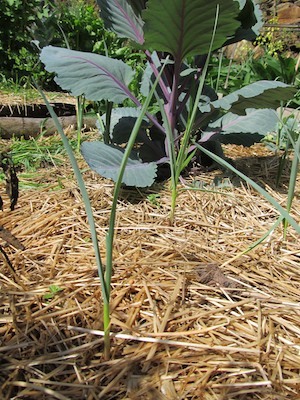 The warm March followed by damp April have sent most of the cabbages bolting straight to seed, but we’re enjoying the flower heads as a vegetable – sweet and tender – along with the also-bolting rainbow chard and perpetual spinach, and the first asparagus tips. 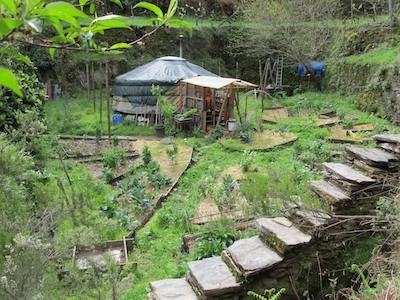 We’ve made progress with planting this year towards the eventual forest garden that will occupy much of this quinta. The superb job Duncan has been doing in thinning and clearing the woods has opened up space for planting birch (Betula spp. ), medronho (the local strawberry tree, Arbutus unedo), Portugal laurel (Prunus lusitanica) and around 2 dozen blueberries (Vaccinium spp.) which will enjoy the acidic soil beneath the pines, though less so the dry conditions in summer so we’ll see how they do before planting more extensively. This is just a small start. There is much more to do here. Shade trees: half a dozen birches (Betula spp.) and a weeping willow (Salix babylonica). Fruit trees: a mulberry (Morus nigra), 3 pears (Pyrus communis, a selection of old varieties – Comice, Williams and Beurre Hardy – to complement the local Rocha growing here, the Williams and Comice in the yurt terrace raised beds to provide shade), 1 greengage (Prunus domestica ‘Reine Claude Verte’), 1 orange (Citrus × sinensis) and 1 tree tomato or tamarillo (Solanum betaceum). Fruit bushes: 2 gooseberries (Ribes uva-crispa), 2 jostaberries (Ribes × nidigrolaria, a blackcurrant-gooseberry cross), 2 goji berries (Lycium barbarum), around a dozen tayberries (Rubus fruticosus x idaeus), raspberries and yellow raspberries (Rubus idaeus) and about 3 dozen blackcurrants (Ribes nigrum) and redcurrants (Ribes rubrum). 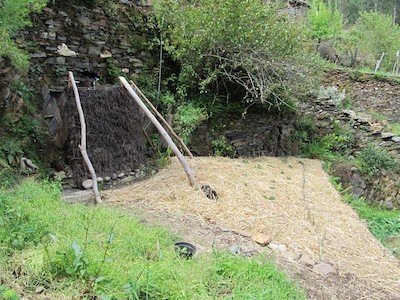 Two previously uncultivated terraces have been cleared of perennials like couch grass, brambles and nettles, then mulched and planted: a new fruit terrace and the area around our solar outdoor shower which is now a mixture of fruit and vegetables. 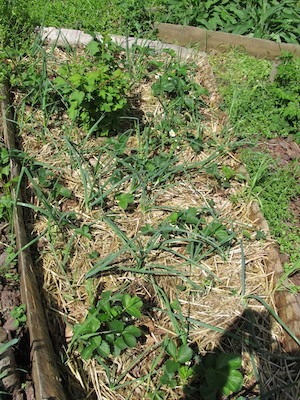 In the existing beds, the asparagus is now getting into its stride, onions and comfrey are appearing everywhere and the strawberries are in flower and producing lots of new leaves. 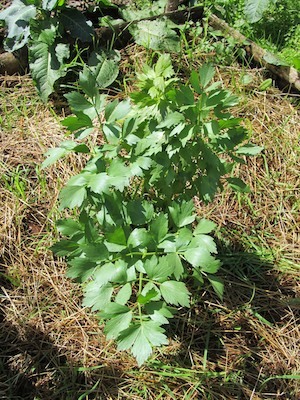 The lovage is coming back strongly and I’ll be sowing the bed with rocket and coriander to see if the delayed flowering effect we observed last year with the brassicas planted around it can be repeated with these two species that have a tendency to run straight to seed in this climate. There’s an interesting difference in how well the garlic is doing in one of the Hügelbeets compared to the non-Hügelbeet right next to it. 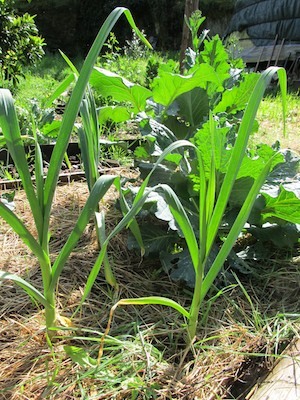 It would be nice to be able to attribute this difference to Hügelkultur, but I suspect it has more to do with a) the kitchen sink drainage channel which runs alongside the Hügelbeet and b) a garlic bulb with poorer than average vigour in the ordinary bed. There could be a Hügelfaktor at work here, but it’s still difficult to be certain. 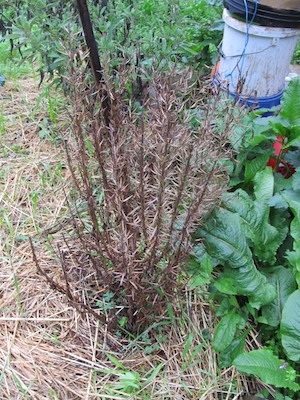 And here’s a plant that didn’t make it through the cold of winter. Clearly this isn’t the best position for rosemary (Rosmarinus officinalis) as another bush planted outside the main building is thriving with only minimal frost burn to the leaves. I will find a herb that disappears underground for the winter to take its place. Good to hear your garden is banging! I’m very curious about the tree tomato you planted: Is it frost hardy? Or did you find it a microclimate spot without frost? Have a great Spring yourself!